Responding to the violent deaths of five children in the Yemeni port city of Hudaydah on Thursday [28 February 2019], Henrietta Fore, Executive Director of the United Nations Children’s Fund (UNICEF), said that Yemen’s civil war continues to take a “horrific toll” on children. 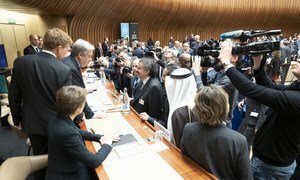 The warring parties in the country signed a UN-led partial ceasefire agreement last December, but this did not spare the five children from being killed in an attack on the Tahita District, to the south of Hudaydah, which is a crucial gateway for the entry of aid, desperately needed to save millions in Yemen from starvation. Mr. Cappelaere also noted that generosity and aid will not, on their own, bring an end to children’s suffering in Yemen, and called on warring parties to “put an end to violence in hotspots and across all of Yemen, protect civilians, keep children out of harm’s way and allow humanitarian deliveries to children and their families wherever they are in the country.” (SOURCE: UN News).